Hubble variable number one, or V1, and resides two million light-years away in the outer regions of the neighboring Andromeda galaxy, or M31. The star helped Edwin Hubble show that Andromeda lies beyond our galaxy, radically changing our view of the universe permanently. BOSTON — In homage to its namesake, the Hubble Space Telescope recently photographed a star that astronomer Edwin Hubble observed in 1923, changing the course of astronomy forever. The star is a variable star that pulses brighter and dimmer in a regular pattern, which allowed scientists to determine its distance, suggesting for the first time that other galaxies exist beyond our own Milky Way. Views of a famous pulsating star, the Cepheid variable V1 in M31, taken nearly 90 years apart, along with a portrait of its galactic home are shown in this image collection. The tiny white box just above center outlines the Hubble Space Telescope view. An arrow points to the Hubble image, taken by the Wide Field Camera 3. The snapshot is blanketed with stars, which look like grains of sand. The new Hubble telescope observations were revealed May 23 at the meeting of the American Astronomical Society in Boston. Astronomers with the Space Telescope Science Institute's Hubble Heritage Project partnered with the American Association of Variable Star Observers (AAVSO) to study the Cepheid variable star V1. AAVSO observers followed V1 for six months, producing a plot of the rhythmic rise and fall of the star's light. By calculating a Cepheid variable's intrinsic brightness, and comparing it with the star's apparent brightness (which will get dimmer the farther away it is), astronomers can calculate the object's distance. Before Edwin Hubble's discovery, many astronomers believed that the universe contained only one galaxy, the Milky Way. Some researchers argued that fuzzy objects called spiral nebulae, including a bright one called the Andromeda nebula, were actually galaxies in their own right. It was the observation of V1, which could be definitively established to lie farther than the bounds of the Milky Way, that proved other galaxies exist. After reading a letter from Edwin Hubble describing the measurement, famed astronomer Harlow Shapley, famous for espousing the idea that the Milky Way was the only galaxy in existence, reportedly told a colleague, "Here is the letter that destroyed my universe." The Hubble Space Telescope was named after Edwin Hubble. In fact, when the observatory was launched on space shuttle Discovery in 1990, the mission also carried copies of the photograph Edwin Hubble made of V1 in 1923. This illustration shows the rhythmic rise and fall of starlight from the Cepheid variable star V1 over a seven-month period. The illustrated graph shows that V1 completes a pulsation cycle of brightening and fading every 31.4 days. 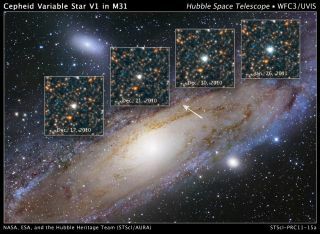 And in honor of this game-changing discovery, the Hubble Space Telescope pointed its lenses at V1 for the first time in December 2010 and January 2011. Hubble scientists partnered with amateur astronomers working with the American Association of Variable Star Observers, who took their own observations of the variable star to establish the best times at which to view V1. Though the observations aren't breaking much new ground, science-wise, they're valuable as a way to tie present astronomy to its roots, said Lisa Frattare of the Hubble Heritage Project at the Space Telescope Science Institute. "A scientist would not be able to take these observations," Frattare said, explaining that the science benefits of the observations would not be valuable enough to beat the competition for valuable Hubble observing time. "This is more of a public relations observation. It's a worthy thing that we went back and observed it. It was worth the orbits that we used."